Should You Be Writing Shorter Sentences? Last week, I tackled shorter paragraphs. Today, I want to take a look at sentences. Whether you’re writing fiction or non-fiction, sentence length matters. Short, snappy sentences (or even sentence fragments) create a very different effect from long, complex, thoughtful sentences. In school, you were probably told that every sentence should contain a verb. This is important if you’re writing an essay or academic paper – but if you’re working on blog posts or fiction, your sentences definitely don’t have to all contain a verb. I’ll come on to this in some of the examples, but first, I want to explain a couple of reasons why short sentences are important: readability and pace. Like short paragraphs, short sentences are easier to read. Each one expresses a clear, stand-alone thought. Readers can move through them fast – ideal for blog posts, thriller novels, newspapers and so on. I’m Dave Navarro – but you don’t care about me, you care about you. Your business. Your customers. Your cashflow. Let’s focus on that. You want to grow. I’m here to help, with one-on-one consulting, done-for-you services, and a whole catalog full of training so you can quickly learn how to get more people to buy what you’re selling, every day. This is from the home page of www.thelaunchcoach.com and it’s acting as a sales page. Dave needs to grab and maintain attention, and the short sentences help do that. Several sentences here don’t have verbs: Your business. Your customers. Your cashflow. They’re technically fragments – but that doesn’t matter. They’re achieving the effect that Dave is going for. I’m Dave Navarro – but you don’t care about me, you care about you. You care about your business, your customers and your cashflow. This is still clear, but it doesn’t carry the same sense of energy and forcefulness that I associate with Dave and his writing. It comes across as a little bit slow. You want to grow. I’m here to help. One-on-one consulting. Done-for-you services. A whole catalog full of training. All so you can quickly learn how to get more people to buy what you’re selling, every day. Plus, the emphasis created by the new structure doesn’t fit with Dave’s message. Dave’s just said that the focus is going to be on the reader – but now his short, emphatic sentences are pulling the focus onto what Dave is selling. Short sentences are great, but they’ll only work if you don’t overdo them – as we’ll see in the next section. In fiction, short sentences tend to pick up the pace. They can be used in thrillers and suspense novels to heighten tension. “What if I fail the test again?” she asked on the way home. There’s no chance you’re going to fail it, I thought. But didn’t say so. After all, it was not my call. She would have to live with the camp’s verdict. We both would. “Then you’ll be disappointed,” I answered. James starts off with a one-word sentence, “Perfectionism.” When reading, we immediately pause, which gives us time to take in the concept. The “well, perfect” makes us stop in our tracks too, especially as it’s not just a two-word sentence, it’s a two-word paragraph. Perfectionism is a tricky little concept. People work like dogs at a project and smile as they say they just want something to be so stellar, so excellent, so clearly brilliant that it’s, well, perfect. Some of the power of the writing has been lost, and the “well, perfect” doesn’t have anything like the same impact. Can You Go Too Far With Short Sentences? Variety is important: sometimes, you’ll want to throw in short sentences to change the pace, but other times, you’ll want longer, gentler sentences. Some writing styles suit longer sentences, too. If you read a few posts by Darren Rowse on ProBlogger, you’ll see that his sentences tend to be longish. This fits well with his gentle, measured way of writing. So … it’s your turn to play with sentences. Take a piece of your own writing and copy it into a new document. Try changing around the sentence lengths. What happens if you merge three short sentences into one long one? How about breaking up one long sentences into several short ones? If you’d like to take this further, consider how sentences work as part of your own voice and style. Do you want a hard-hitting, energetic style or an easy-going, moderate one? What feels natural for you? Want more in-depth writing tips and advice? Make sure you’re a member of the Aliventures weekly email newsletter – you can find out more and sign up here (it’s completely free). 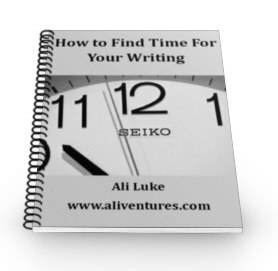 You’ll get a mini-ebook, How to Find Time For Your Writing, as soon as you’ve joined. Love that you use the masters like Dave, Elizabeth and James. It shows you read as well as right. You use critical thinking and analysis to learn and improve and then teach us sloggers. I had just finished my last post, read this, and then went back and shortened a couple sentences for punch and clarity. Thanks. Hi, Ali! Another great advice :-). Thank you. I’m still a new writer but I really am learning a lot from you. I like that you made a continuation of your previous post on writing shorter paragraphs. Reading this one made me think of one of my favorite authors, Sidney Sheldon, whose novels have always been so fast-paced and thrilling with short sentences and paragraphs too. I like what you shared about James’ article because it has a variety in it. Short sentence first for a dramatic pause, then longer sentence, then shorter sentence AND paragraph at the end. I will use this style in writing and I’ll share it with you once I have it :-). Cheers! And very glad to help. I don’t know Sidney Sheldon, but I do know that a lot of novelists make deliberate use of short sentences (and paragraphs) to help with pace. I love the way short sentences/fragments can pick up the pace of a story or make a strong point. I tend to use short paragraphs and short senteces a lot in flash fiction. There’s a lot less room for the “extra” words. Plus, it fits with the short, sharp feel of flash fiction. Yep — I think short paragraphs/sentences are perfect for flash fiction. (And, actually, it’s amazing how many words you can cut when you need to get a story under a certain length! Short paragraphs – I can do. But short sentences – that’s tough. You’ve given me something to think about, Ali. As usual, well done! You had some pretty short sentences in that comment, Jeff. 😉 And thanks! Thanks, Jessica! Do give it a try — sentence length is so easy to play around with, and it can have a surprisingly strong effect. Ali, but writing short sentences is something a copy writer does and not everyone can do that right. I just wanna share info with my readers. Everyone can improve, in my opinion! You don’t have to be a copywriter to care about good writing. I find that information is much easier for readers to absorb when it’s presented in an easy-to-understand way — and short sentences are part of that. I have also been receiving your posts by email and the information you provide is very encouraging and I’ve added you to my blog so I didn’t miss a thing.